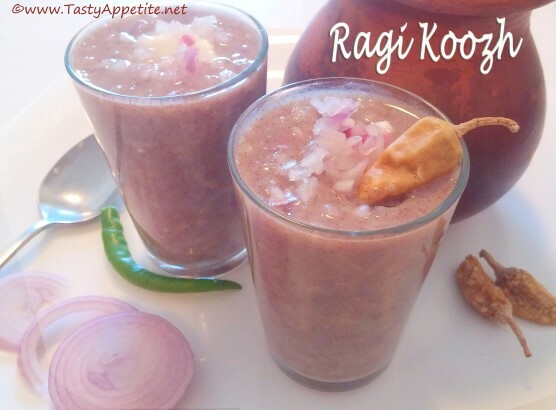 Ragi Koozh is one of the perfect cooling & healthy drink of summer season. This nutritious one pot meal is very good for health & highly nutritious. In South Indian cuisine, this koozh is offered to Goddess and make it as a festival celebration during aadi (summer) month & is distributed among everyone as prasadam. It tastes divine with a combo of onion, vadam, vathal, sundal, pickle, etc. Also thick koozh can be eaten as such as one would eat paddy rice. Lets how to prepare Ragi / Keppai koozh with this easy video recipe. Its highly nutritious and loaded with protein, vitamin B, iron and amino acids. Its very helpful for weight loss and plays a unique part in diet programme for weight loss. Its helpful in reducing bad cholesterol and aids in digestion. Its good for the treatment of anemia and helpful in lactation. It increases the bone strength & very good for kids. Add ragi flour in a mixing bowl. Add 3 cups of water and mix to smooth thin batter. Close it with lid and let it ferment overnight or minimum 6 to 7 hours. Slice onions and keep ready. Wash and cook rice till soft. Mash the rice and keep ready. Now heat 6 to 8 cups of water in a thick bottomed pan. Once the water starts boiling add salt and stir. Add the fermented ragi batter and stir. Keep the flame in medium and stir continously, so that no lumps are formed. If the batter consistency is thick, add some 2 more cups of water as shown in video and adjust the consistency. The batter consistency should be thin. Now keep stirring the batter in medium flame. Let the batter cook for 10 to 15 minutes with constant stirring. Take care the batter does not stick to the bottom. So constant stirring will be helpful. 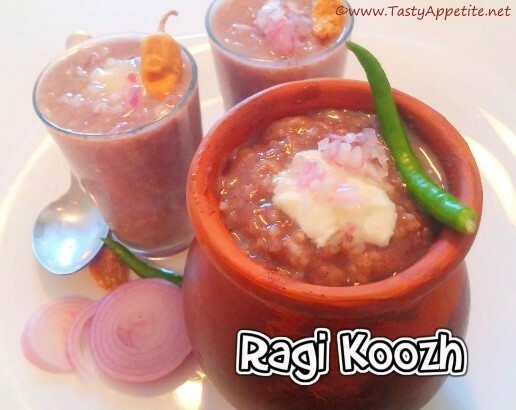 Now you can enjoy the inviting aroma of ragi koozh. Its time to add the cooked and mashed rice. Stir continously for another 5 minutes. Turn off flame and allow to cool completely. You can see the koozh has come to thicker consistency. Healthy & delicious summer special Ragi Koozh is ready. Take 5 to 6 ladles (or as required) of koozh and add to mixing bowl. Add sliced onions and mix. Add water if required to adjust the consistency of the koozh. Pour in glass and garnish with curd, sliced nions and green chilli. Yummilicious homemade Ragi koozh is ready. We enjoyed koozh along with fried mormilagai. For the latest food recipes, health tips and updates, like us on Facebook, subscribe on Youtube or follow us on Twitter.